I've prepared a screenshot tour so that users who have not yet received any inquiries can see how it looks. If you don't know how to get your inquiries to show up in OwnerRez, I wrote an article about that a few days ago. This is a soup to nuts rundown from the first moment you get an alert to the last moment you fire off your response. 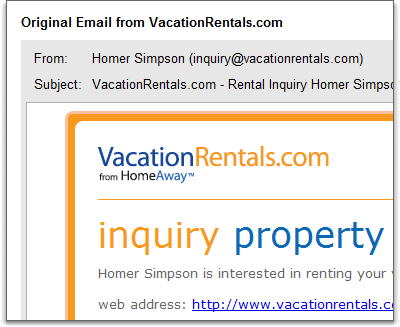 When an inquiry email is sent to you from a listing site, OwnerRez sends you an email alert. As with all other alerts, the email message contains a link so that you can open the full inquiry and get right to work. Once opened, you'll see the overview page of the Inquiry record. 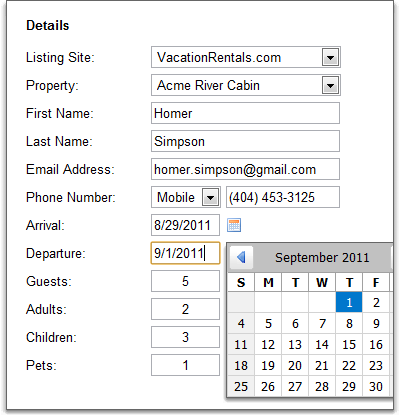 The overview page is similar in design to the quote and booking overview pages. 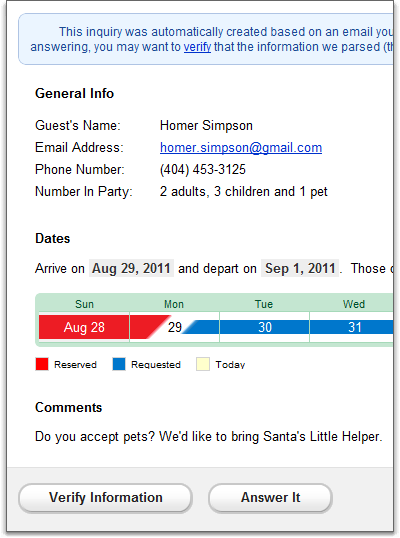 You see the guest details, what dates were requested and any comments. The requested dates are presented in a miniature calendar that shows what dates are already reserved. The requested dates are overlaid across the reserved dates to provide visual context. Before answering the inquiry, it is wise to use the "Verify" link to make sure that our system parsed the inquiry correctly. While we have worked very hard on our parsing techniques, from time to time the listing sites will change their email formats which cause our parsing scripts to be off. We will correct the parsing logic as soon as this happens but it may take a few days for us to catch the change and adjust for it. You can find "Verify" links in several places on the overview page. The verification page may look big and confusing at first, but it's actually quite simple. The blue summary bar at the top explains what's going on, and I'll reiterate those points below. On the left, you'll see the original email message sent to you by the listing site. The message is untouched by our system - we do not change anything. It is stored exactly as it was originally sent. Below the message, there is a "Download" link that lets you save a copy of the message to your local computer. The message is downloaded in the "MIME" format which is readable by virtually all email programs including Outlook, Thunderbird, Windows Mail, Lotus Notes and Eudora. There is no need to download your messages. Our system has saved them using enterprise storage services and they will always be available to you online. On the right, you'll see a set of fields that show the values we parsed out of the email message. 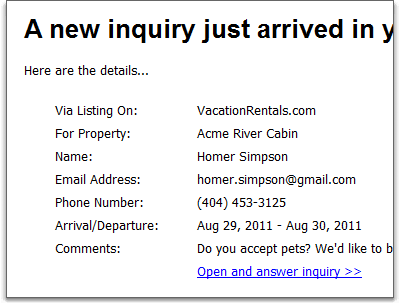 We currently parse messages from VRBO, HomeAway, FlipKey, VacationRentals.com, Vacation Home Rentals and Perfect Places. We've tested our parsing algorithms against thousands of inquiry emails, and we're very confident of their strength. That being said, it is possible from time to time that you may need to correct something or fill in details that are missing on the email. For instance, the inquirer may not have included the dates they were interested in but told you later on the phone. You'll want to go back to the verification page and fill in those details so that you can generate a quote based on the full information. Make sure to click the "Save Changes" button at the bottom when you're finished. After verifying, you'll want to answer the inquiry - that is of course the whole point of the process. There is an "Answer" tab on the inquiry as well as a link on the overview page. 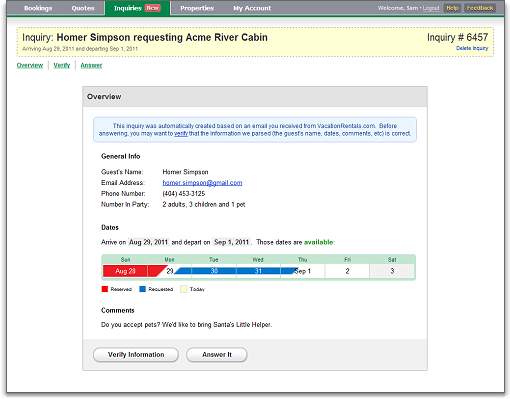 If the requested dates are unavailable or the inquiry is missing information, such that a quote cannot be generated, the answer page will show a simple email form so that you can reply to the guest and explain the problem. By default, message bodies are provided for both types of scenarios. 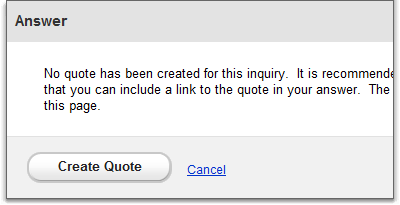 If the requested dates are available and the inquiry has all necessary information - in other words, the inquiry is "quotable" - the answer page will present you with a button to create a quote. 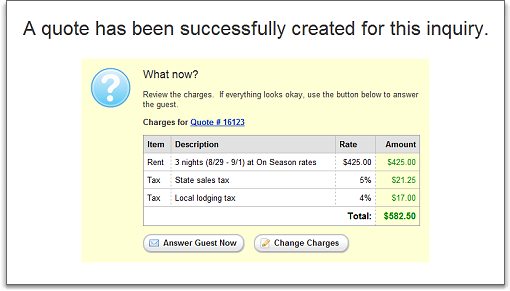 After the quote is created, a preview of the quote charges is shown in the same page so that you can visually review the line items before sending it to the guest. If you need to change the line items, a button is provided for you to do that. Once changed, the quote page will return you back to the same inquiry page so that you can continue moving forward with your answer. If you didn't need to change the quote, you're already there. 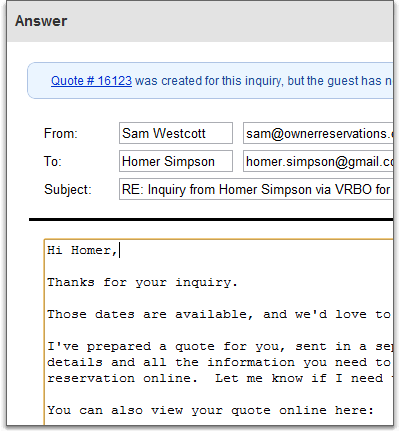 Click the "Answer Guest Now" button and a simple email form will appear with a preloaded message for the quote you generated. 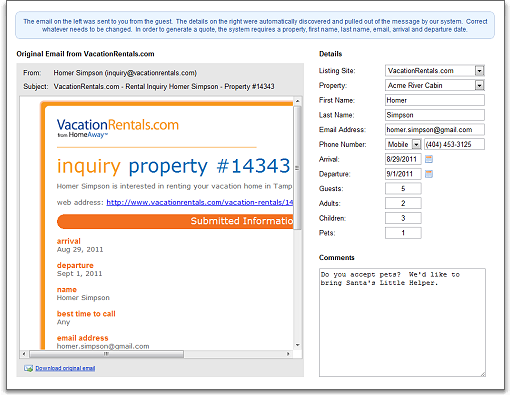 The simple email form is the same design as other email forms in the system. You have the option to change the inquirer's email address, the message subject and the message body. What you see below the body is the reply that will be appended to your message. After sending your email, you'll see a confirmation message telling you that it was sent. Be sure to *also* send the quote email as well. 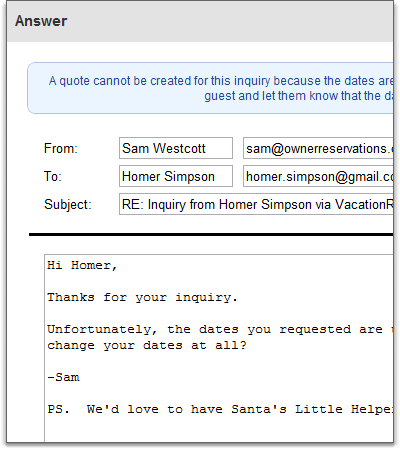 To be clear, the quote email - the email that shows the quote charges directly in the message body - is not automatically sent when you send the inquiry email. You must tell the system to send that email separately. A button to do that is included in the confirmation message.